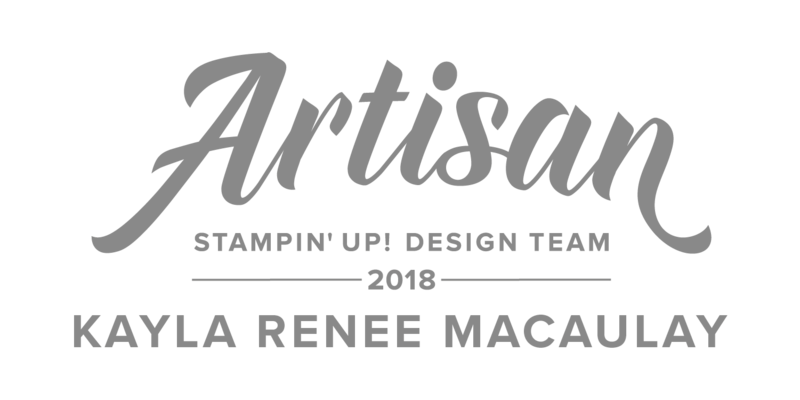 Hello everyone and welcome to another Stampin' Up! Artisan Design Team blog hop. 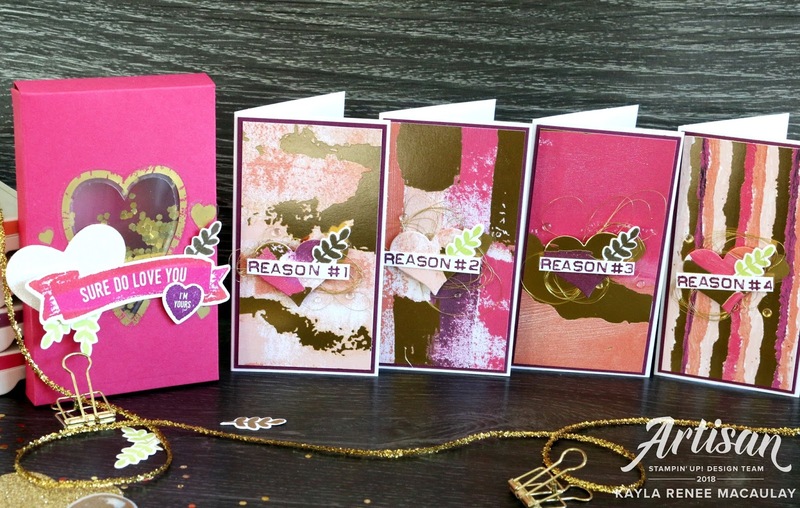 This month we are featuring the ever so gorgeous Painted With Love Suite from the Occasions Catalogue with a special feature on the Sure Do Love You Stamp Set and Painted With Love Designer Series Paper. When I first saw this new catalogue, this is one of the first suites that I fell in love with. 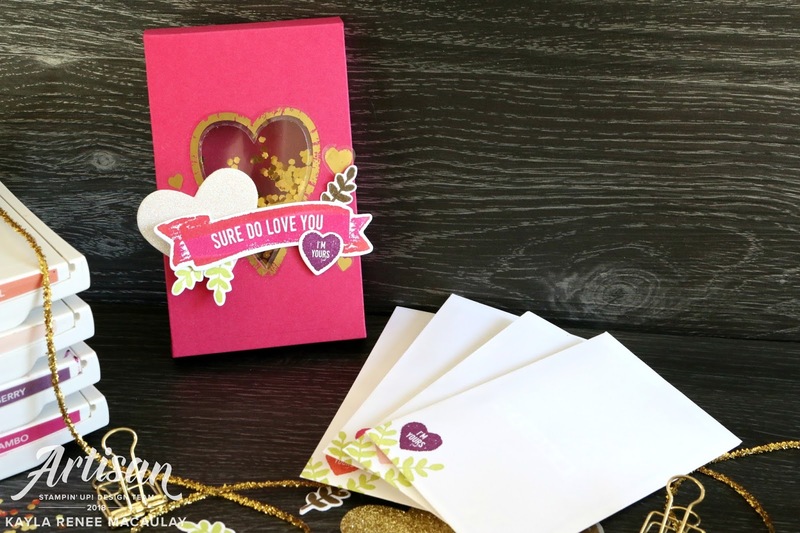 I love the beautiful rich colours with the gorgeous gold foil and I love that you can use it for so much more than just Valentines Day. Valentines Day isn't a huge holiday here in Australia, so for me this was the perfect opportunity to just focus on making some projects that are love themed for any time of the year! Having said this Valentines Day actually falls on my partner and I having been together for 6 months. It's been an amazing six months and I wanted to make something special for him. With that in mind I created a gift set comprising of; a handmade card, a gift bag to place a special gift in and a box using the Lots To Love Box and Framelits containing the Narrow Notecards with just four of the reasons why I love him! It's a bit of a different use for the box than just presenting cards in it. I hope that Declan loves it (well I know he will, because he's a bit of a romantic) and will treasure it for years to come. Here's a look at the completed gift set ready to go. I used some repetitive stamping on the gift bag with one of the tiny heart stamps from the Sure Do Love You Stamp Set and then used the heart die from the Lots to Love Box and Framelits to create a repetitive tone on tone background on the coordinating card. I love repetitive background, it makes for a quick and easy background that is sure to wow. Here's a look at the little box I made from the Lots to Love Box and Framelits that fits the Whisper White Narrow Notecards and Envelopes perfectly. I made these notecards to write just four of the reasons I love my beautiful partner (trust me there are many more reasons!) I hope that he will treasure this gift and these love letters to him for many years to come. 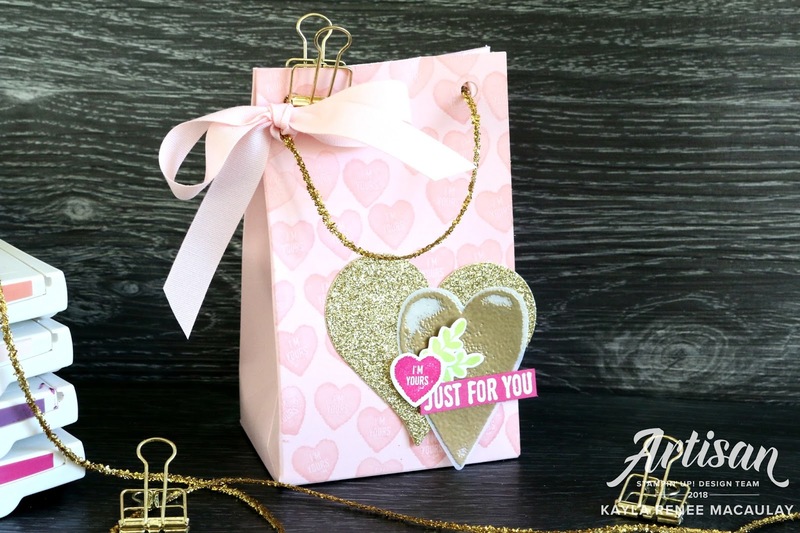 I also made a coordinating gift bag using the Gift Bag Punch Board and some the Painted With Love 12x12 Cardstock and then decorated with some of the coordinating Love Mini Tinsel Trim Combo Pack and added some hearts and love themed embellishments to finish it off. Inside I popped a hand engraved ring with lyrics to our favourite song. Lastly a look at the card that I made him. I layered a mixture of Basic Black, Melon Mambo and Rich Razzleberry cardstock. I love that the Sweet and Sassy Framelits coordinate with this suite of products so well. I also added some Gold Glitter Flakes as sequins to my background. I hope that he loves this project as much as I loved making it for him. I am sure there will be many more love themed projects and occasions in the future with my gorgeous partner Declan and I love that Stampin' Up! make such beautiful products to create handmade gifts with love! I hope you enjoyed this blog hop today and be sure to pop along to the rest of the Artisan Design Team's blogs to see what else the rest of the team have made this month with the Painted With Love suite.